Papa Painguin are enemies that appear in Donkey Kong Country: Tropical Freeze. They are a tougher variant of the Painguin Tuck enemies. 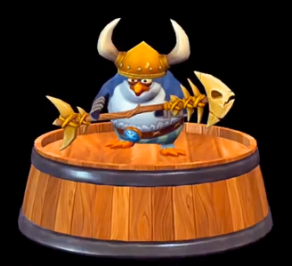 The Papa Painguin is considerably tougher that their inferior counterparts; they have a spiked helmet to protect their heads and a spear to protect their sides, thus, the only way to defeat this enemy is to Ground Pound the area near them, stun them, and then Roll on them. This page was last modified on 5 March 2016, at 07:34.